The second novel in Raymond Benson’s Spike Berenger rock ‘n’ roll series was released in March of this year, only a year after A Hard Day’s Death. 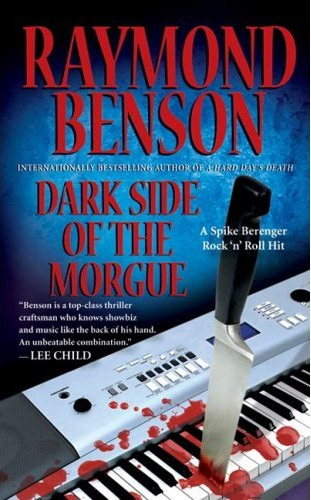 While Dark Side of the Morgue is often a fun read and has much to like, most specifically Benson’s great knowledge and love for music that pours from the pages, it ultimately fails to surpass its predecessor. As the story goes, private investigator Spike Berenger is called out to Chicago to investigate a mysterious serial killer who is bumping off musicians involved with a group called The Loop, which in the early 70s split into two different groups. It’s a solid premise, but where it begins to go wrong is how none of the former bandmates have any sort of self-preservation. Their friends are being killed off at a fast pace and they oddly just go about their lives. Worst of all they don’t even trust Spike to help them, who is offering his aid to the best of his ability. They’re stupid really, but the police department is probably even dumber. Several musicians in their city are being killed and the police can’t even confirm that the deaths are connected even when the evidence is hit-you-in-the-face obvious. Or maybe they just didn’t want to confirm it. I won’t really fault Benson for this, but what I did find rather annoying was how Benson continuously dragged out “secrets” to prolong the book. At least in my opinion. There was one point where Spike learns a “secret” then forgets to tell his partner when he has the chance – because telling his partner would be equivalent to telling us. So two chapters later, at the very end of a chapter he even throws out a “Oh I forgot to tell you…”, but then proceeds to do so between chapters. So that secret gets dragged on for another chapter. By the time this “secret” was exposed, it wasn’t a secret. Additionally, there were other little annoyances about how the author handled things that I thought were kind of ridiculous. For instance, Spike gets 3 voicemails, he conveniently only listens to 2. One of the voicemails was garbled because if it wasn’t one possible ending could have been struck from the list. Stuff like that. So yeah, all in all, I will say that it’s entertaining for a good portion of the book, but is rather frustrating at times as you feel the book get stretched further and further. It’s a solid entry into the Spike Berenger series, but when all is said and done, A Hard Day’s Death was clearly the better of the two. All that said, I do hope Raymond Benson gets the opportunity to carry on the series because there is a huge amount of potential here. The characters are good, the rock ‘n’ roll premise is still fresh and unique – I just can’t say I’m not eagerly awaiting a third book. The short story “On The Threshold of a Death” (“A Spike Berenger Rock ‘n’ Roll Hit Single”) will hopefully tide me over.